Super coils are mostly used in the plastic injection moulding industry and are supplied EX STOCK in a variety of sizes and wattage's. They are supplied with or without a built in thermocouple. They are designed to give a high amount of heat within a very small space. 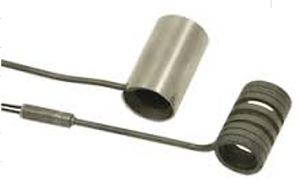 There is also the option to have the super coil incapsulated within a s/steel jacket thus reduction heat losses.